Please Note: This brochure was originally published by Tri-Lane Distributing Ltd. of Tottenham, Ontario, Canada to help its dealers clear up some misconceptions about wood energy. 1995 Tri-Lane Distributing Ltd. Produced for Tri-Lane and adapted for viewing here by Gulland Associates Inc. Does heating with wood cause global warming ? What about local air quality ? Does wood heating harm the forest ? By heating with wood you do not contribute to the greenhouse effect as you would by heating with one of the fossil fuels like oil and gas. When oil and gas are burned, carbon that has been buried within the earth for thousands of years is released in the form of carbon dioxide, a by-product of combustion. The result is an increase in the atmospheric concentration of carbon dioxide, the cause of the greenhouse effect. Although carbon makes up about half the weight of firewood and is released as carbon dioxide when the wood is burned, it is part of a natural cycle. A tree absorbs carbon dioxide from the air as it grows and uses this carbon to build its structure. When the tree falls and decays in the forest, or is processed into firewood and burned, the carbon is released again to the atmosphere. This cycle can be repeated forever without increasing atmospheric carbon. Heating with wood, therefore, does not contribute to the greenhouse effect. And there’s more good news: when the use of wood for energy displaces the use of fossil fuels, the result is a net reduction in greenhouse gas emissions. Wood is not an inherently dirty fuel that causes serious air pollution. While it is true that old technology like open fireplaces and simple heaters could not burn the wood completely, the new generation of woodburning appliances produce almost no visible smoke and deliver efficiencies in the range of 70 percent. Developed since 1980, improved technology has cut particulate emissions (smoke) by about 90 percent compared with conventional equipment. Wood may not be the best fuel choice in densly populated urban areas where automobile exhaust and other pollution already puts excessive strains on the air shed. But in suburban, small town, and rural areas, wood makes good sense. Wood contains only a negligable amount of sulphur, an element that leads to acid rain. In this age of environmental awareness, a big advantage of wood over the fossil fuels is that its main environmental impact occurs at the point of use and is visible for all to see. In contrast, the real environmental impacts of oil and gas are hidden from view because they occur during extraction, refining and transportation of the fuels to market. If the destruction of tropical rain forests causes global warming and if planting trees in your community is a good strategy control greenhouse gas concentrations, then how can using wood for home heating be justified? Good question. The answer lies in the natural cycle of growth, maturity, decay and re- growth of trees and forests. A healthy forest is not a museum, but a living community of plants and animals. When trees are used for energy, a part of the forests carbon “bank” is diverted from the natural decay and forest fire cycle into our homes to heat them. The key to ecologically sound and sustainable wood energy use is to ensure that the forest remains healthy, maintains a stable level of variously aged trees and provides a good habitat for a diversity of other species, both plants and animals. You can do your part by insisting on firewood that is harvested using sustainable forestry practices. Ideally, buy your firewood from the person who owns the woodlot because owners are less likely to damage their forest. If that is not possible, question the seller about the origins of the wood. When thousands of families turned to wood heating in the late 1970s and early 1980s to shelter them from high energy costs and the threat of shortages, there was a sudden increase in the number of house fires related to wood heating. Wood heating acquired a bad reputation, mostly because neither the users nor industry had reliable guidelines for installation safety. Since then, however, the wood energy industry and all levels of government have worked together to put in place the same type of safety systems as have been in place for other heating fuels for more than 30 years. The product safety standards, installation codes and professional training for installers and inspectors have resulted in a greatly improved safety record for woodburning. Installed according to the codes and used according to the manufacturer’s instructions, woodburning appliances are no more hazardous to use than any other form of home heating. 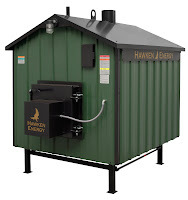 Note from Hawken Energy: Outdoor wood furnaces remove danger of a home fire by moving the combustion outside and requiring caps on the chimneys. Not all outdoor wood furnaces are the same. Ask your local Hawken Energy Factory Rep about the differences and why Hawken is the safest choice. Canada’s Greenhouse Gas Emissions: Estimates for 1990, Environment Canada report.